Well I don't know what your Easter Bunny was up to last year, but ours had a absolutely BRILLIANT idea about a color coordinated Easter Egg Hunt. A color coordinated Easter Egg hunt is the way to go! Not only did it solve a number of problems due to the age differences between cousins... but the kids had a BLAST!! A color coordinated Easter egg hunt. 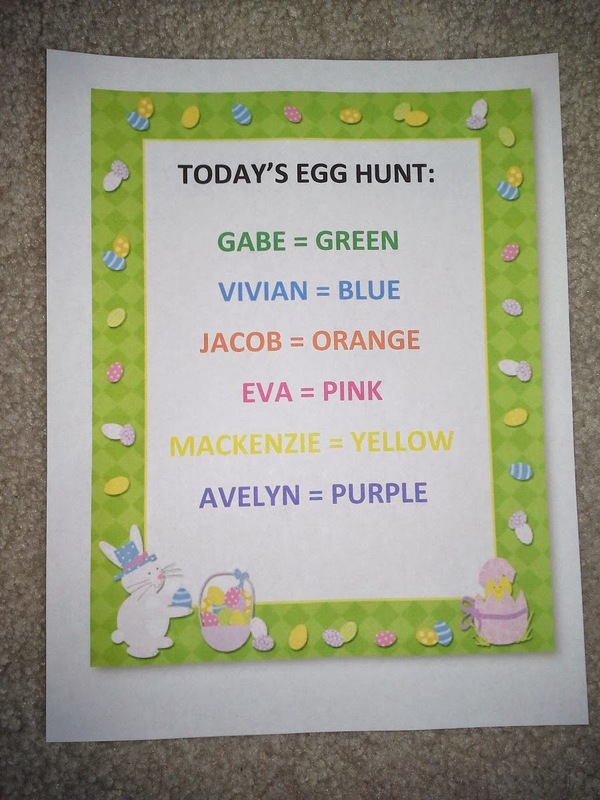 Each kid was able to find their favorite colored eggs. Each of them was assigned a specific egg color. This was fun because the Easter bunny happened to know what each kid's favorite color was. Jacob, for example, loves all things orange (if you can't tell), and the Easter Bunny had assigned him all the orange eggs. Here is Avelyn in action now.. she was hard to photograph in her "natural" setting of a full sprint. This also made it so the Easter Bunny could put the older kid's colored eggs in the more camouflaged or hard to reach/taller places. Gabe really had to work to find some of his more challenging green eggs. We could not believe how well this type of hunt turned out! We even had kids helping each other find their colored eggs. It was amazing. We loved how the Easter egg hunt turned into an absolute success! We had kids helping kids, big kids helping little kids. Little kids spotting eggs and pointing them out to the older kids... AND everyone got about the same number of eggs in their favorite colors! It was a win win for everybody. So if you have a big group of family or cousins that get together for a big Easter dinner and an egg hunt, have your Easter Bunny try out a color coordinated one this year and watch the fun and camaraderie commence! We will definitely be doing a color coordinated event this year and every year to follow.